China's State Council said 357 officials faced demotion or losing their jobs and that 202 had been detained so far. Beijing's decision to punish officials has been welcomed by the Chinese media, with one paper saying the credibility of the authorities is at stake. 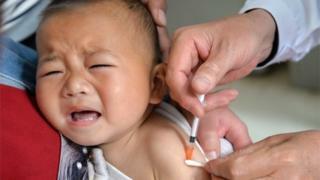 "There have been reports that concerned parents have held back their children from being vaccinated, showing that any misstep would cost the government its credibility and further undermine confidence in the public health system," the English-language China Daily says. Local paper The Beijing News says the decision to file criminal cases has "broken the illusion" that punishment can be dodged. "Lives are at risk," it says. "For the State Council to first announce punishment for 357 people - this is aimed at breaking the wishful thinking among certain officials that they can hide behind other wrongdoers." State mouthpiece People's Daily shared the news on popular microblog Sina Weibo which received hundreds of comments. But the censors appear to have deleted many of them, leaving only comments from users expressing support for the government. News of the scandal has been heavily filtered on the platform in recent weeks.